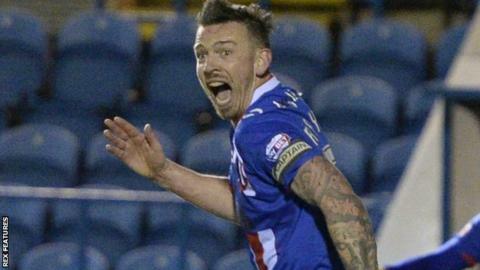 Michael Raynes' late equaliser earned Carlisle United a key point in a 2-2 draw with fellow League Two promotion hopefuls Leyton Orient. Having gone behind through Macauley Gillesphey's free-kick after Jason Kennedy had been hauled down, Orient overturned the deficit. Jay Simpson found space to level after half-time, firing into the left corner. Ollie Palmer then streaked clear to put Orient ahead, before Raynes headed in from Alex Gillead's cross to level. The goal denied Kevin Nolan's visitors the chance to go fifth in the table, as they remain seventh, while Carlisle are three points behind in 11th. "You've got to respect the point, especially when you come to a place like this. "In the end we probably could have snatched it, but if we would have I think (Carlisle manager) Keith Curle would have been equally disappointed. "I'm delighted with the response. Since I've come in we've taken 16 points out of eight games so it's fantastic form and we've got to take positives out of it because we're all disappointed at the moment." Match ends, Carlisle United 2, Leyton Orient 2. Second Half ends, Carlisle United 2, Leyton Orient 2. Foul by Nicky Hunt (Leyton Orient). Corner, Leyton Orient. Conceded by Jason Kennedy. Attempt saved. Calaum Jahraldo-Martin (Leyton Orient) left footed shot from a difficult angle on the left is saved in the bottom left corner. Sammy Moore (Leyton Orient) wins a free kick in the defensive half. Attempt missed. Nigel Atangana (Leyton Orient) right footed shot from the centre of the box is close, but misses to the right. Attempt missed. Nigel Atangana (Leyton Orient) right footed shot from outside the box is just a bit too high. Goal! Carlisle United 2, Leyton Orient 2. Michael Raynes (Carlisle United) header from very close range to the centre of the goal. Assisted by Alex Gilliead. Attempt blocked. Derek Asamoah (Carlisle United) right footed shot from the right side of the box is blocked. Attempt missed. Luke Joyce (Carlisle United) right footed shot from outside the box is close, but misses to the left. Goal! Carlisle United 1, Leyton Orient 2. Ollie Palmer (Leyton Orient) right footed shot from the centre of the box to the bottom left corner. Attempt blocked. Jabo Ibehre (Carlisle United) right footed shot from the centre of the box is blocked. Attempt missed. Kevin Nolan (Leyton Orient) left footed shot from the centre of the box is just a bit too high. Corner, Carlisle United. Conceded by Jerome Binnom-Williams. Foul by Calaum Jahraldo-Martin (Leyton Orient). Attempt missed. Kevin Nolan (Leyton Orient) right footed shot from outside the box is just a bit too high. Attempt missed. Sammy Moore (Leyton Orient) right footed shot from the centre of the box is just a bit too high. Goal! Carlisle United 1, Leyton Orient 1. Jay Simpson (Leyton Orient) right footed shot from the centre of the box to the bottom left corner. Second Half begins Carlisle United 1, Leyton Orient 0. Substitution, Leyton Orient. Ollie Palmer replaces Jack Payne. Substitution, Leyton Orient. Sammy Moore replaces Sean Clohessy. First Half ends, Carlisle United 1, Leyton Orient 0. Nigel Atangana (Leyton Orient) wins a free kick in the attacking half. Nicky Hunt (Leyton Orient) is shown the yellow card for a bad foul. Attempt saved. Jabo Ibehre (Carlisle United) right footed shot from the right side of the box is saved in the bottom right corner.